We love hanging out in cafes, and Phnom Penh is a great place for doing just that. Here are a small selection of what’s available around the Independence Monument and Street 278 areas. Brown Coffee & Bakery has five stores in Phnom Penh, and the Street 57 store is where you can often find us. It has seating both inside and out, and is incredibly popular with both locals and foreigners. It has a very friendly and relaxed vibe, with many people working on their laptops. The coffee here is really good, with an Americano costing $2.10. It has a large selection of bakery items as well. Java Cafe & Gallery is located in an old colonial building, just a very short walk from Independence Monument. The cafe is upstairs, with the exit outside the building on the right hand side. There is a second monument under construction next to Independence Monument, which the balcony of this cafe overlooks. The coffee here is first class, with an Americano costing $2. They also have a range of local coffees, and a fairly extensive food menu that has some vegetarian options, including a vegan burger. Cafe Soleil is a cafe and vegetarian restaurant. The main focus is on vegetarian food, but it’s also a great place to have a tea or coffee. It’s on the lively Street 278, which is a great part of Phnom Penh. There is seating inside and out. It has both Western and Khmer food. An Americano cost $1.25. ARTillery is more restaurant than cafe, but there are often lots of people just stopping by for a coffee while working on their laptops. It’s popular with expats and tourists, and has a range of food including vegetarian, vegan and raw food. They also run a 5-day raw food detox once a month. A French Press organic and fair trade coffee costs $2. Try the Raw Chocolate Orange Tort – it’s awesome. 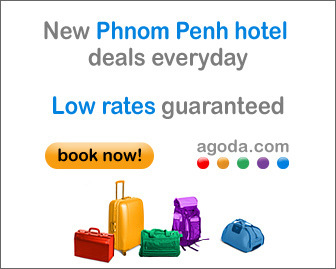 If you’re planning to visit Phnom Penh, check out the following Agoda link for some great hotels.